TOKYO: ONE Championship has just announced that it will be an exclusive partner of Japanese martial arts organization Pancrase. Following a similar partnership announced in January with Shooto, this partnership will likewise see ONE Championship work together with Pancrase to provide Pancrase athletes the opportunity to showcase their martial arts talents and further develop their skills on a global platform. Chatri Sityodtong, Chairman and CEO of ONE Championship, stated: “Following our partnership with Shooto, ONE Championship is excited to offer the same opportunity to Pancrase athletes and World Champions to compete on the world’s largest stage for martial arts. Masakazu Sakai, President of Pancrase, stated: “Pancrase is excited to announce our partnership with ONE Championship, which will help to raise the profile of our athletes, as well as provide them with greater development opportunities on a global stage. Under the terms of the partnership, all Professional Pancrase World Champions will receive the opportunity to compete in ONE Championship, the world’s largest martial arts organization. Athletes who compete in Pancrase’s Neo-Blood Tournament will also receive the opportunity to compete in ONE Championship’s ONE Warrior Series. In addition, select amateur Pancrase athletes will receive the opportunity to train at Evolve MMA in Singapore for a year. 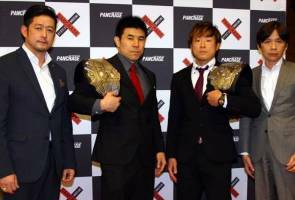 Pancrase has already produced a number of ONE Championship’s top Japanese athletes. This includes Yuya Wakamatsu, a Pancrase Flyweight Champion who will be facing off against 12-time Flyweight World Champion Demetrious Johnson in the upcoming ONE Flyweight World Grand Prix taking place at ONE: A NEW ERA on March 31 at the Ryogoku Kokugikan in Tokyo, Japan. Other Pancrase World Champions that are currently competing in ONE Championship include Daichi Abe, a former Pancrase Welterweight World Champion, and Kazuki Tokudome, a former Pancrase Lightweight World Champion. Evolve MMA is Asia’s No. 1 martial arts training facility boasting of a world-class instructor team which features the most number of World Champions available anywhere in the world in martial arts disciplines such as Muay Thai, Brazilian Jiu-Jitsu, MMA, and boxing, among others. It is the largest and most experienced martial arts team in Asia with over 1,000 years of World Championship experience collectively. Pancrase is a mixed martial arts organization founded in Japan in 1993 by professional wrestlers Masakatsu Funaki and Minoru Suzuki, with the origin of its name based on pankration, a form of combat sport in the Ancient Olympic Games. Pancrase combines various forms of martial arts, including wrestling, judo, boxing, sambo, karate, kenpo, jiu-jitsu and Muay Thai. Pancrase has produced some of the world’s top martial artists, including Yuki Kondo, Bas Rutten, Josh Barnett, Ken Shamrock and Frank Shamrock. Pancrase has since become one of the most popular and well-established martial arts organizations both within and outside Japan.